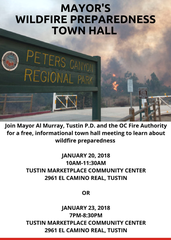 Join Mayor Al Murray, Tustin P.D. and the OC Fire Authority for a free, informational town hall meeting to learn about wildfire preparedness. Free giveaways to the first 150 attendees and a Q & A with an expert panel.